When it comes to horror writing, there are some names that everybody recognizes— authors such as Stephen King, Edgar Allan Poe, and H.P. Lovecraft. But there are a huge number of other writers out there, whose bloodcurdling tales haven’t received nearly the amount of attention they deserve. Here, then, are six authors whose spooky works are sadly underrated. A contemporary writer who definitely needs more recognition, Dale Bailey has a number of terrifying novels and short stories to choose from. With a style reminsicient of Ray Bradbury or Richard Matheson, Bailey combines both supernatural and realistic horror to chilling effect. His short story Snow, for example, is a post-apocalyptic tale that combines the fear of the end of the world with the terrors of an alien species. While he often uses familiar horror settings, such as spooky small towns and haunted houses, he also branches out into more unorthodox places: his novel The Subterranean Season revolves around a bottomless pit discovered on a college campus, and provides both scares and black humor in equal measure. Howard’s best-known work is The Cazalet Chronicles, a family saga spanning five novels and detailing the changes in English society during the war years. However, she was also a fantastic writer of scary stories and her horror fiction deserves much wider recognition than it receives. Howard’s first foray into horror was in 1951, when she collaborated with Robert Aickman (also featured on this list) on a collection of ghost stories, We Are For the Dark. Together, the two writers experimented with many themes that have become hallmarks of modern ghost stories, such as psychological discomfort and an emphasis on human neurosis. Howard later went on to publish Mr. Wrong, a collection of subtly chilling stories including the titular one— a tale of automotive horror that makes Stephen King’s Christine look positively lame. Equal parts ghostly hauntings and Hitchcockian thrillers, Howard’s creepy tales are definitely ones that deserve a wider audience. Despite the praise heaped on him by his peers (Stephen King describes him as “one hell of a fiction writer,” while Charles L. Grant considered him “the best short story writer in the field today, bar none”) Dennis Etchison has yet to achieve bestseller status or the wider appeal of other horror writers, making him chronically undervalued. Although he has a number of novels to his name, including novelizations of several horror films, where Etchison really shines is in the realm of short fiction. His short stories are stark and unflinching depictions of the dark sides of human nature. On the Pike remains one of the most disturbing depictions of cruelty I’ve read, while White Moon Rising uses rapidly shifting points of view to create a shattering narrative of murder on a college campus. Etchison is a master of psychological horror, a writer who can really get under your skin and frighten you from the inside out. Robert Aickman’s “strange tales,” as he called them, never achieved much commercial success. He even wondered himself if “anything by me will ever be published again.” Although Faber & Fabert publishing house has recently begun an extensive repring of Aickman’s stories, his work can still be hard to find and he remains somewhat obscure. This is a shame, as Aickman truly is a master storyteller who deserves much wider recognition. His dark tales are uniquely unsettling, and are full of strange ambiguities and a pervasive sense of impending doom. It is not unusual to come away from an Aickman story knowing that something disturbing has happened, and yet unable to say exactly what it is that transpired (his short story Ravissante is an excellent example— I have no idea at all what happened, but whatever it was, it thoroughly creeped me out). Haunting and unforgettable, Aickman is definitely one of the most underappreciated writers on this list. A prolific author of detective fiction, the late Basil Copper was also an often overlooked master of the macabre. In addition to writing a series of original mysteries and continuing the Solar Pons stories begun by August Derleth, Copper also penned a number of shiver-inducing novels and short stories. Many of his works have a decidedly Lovecraftian tone (he even contributed a story to the Cthulhu Mythos) while others are hair-raising tales of real-life horrors. Camera Obscura, his story of a greedy moneylender who meets an eerie fate, was the basis for an episode of Rod Serling’s Night Gallery. In a less otherworldly vein, his short story Bright Blades Gleaming is the diary of a murderer, made all the more chilling by its precise, matter-of-fact tone, and the sudden twist at the end (let’s just say the murderer is one you’ve heard of). 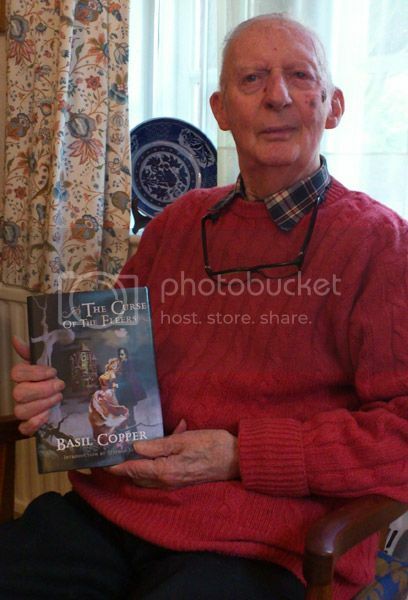 With a sizeable body of work to explore, Basil Copper is definitely an undervalued author who is worth your time. English author Edith Nesbit is best known for her enchanting children’s stories, including such classics as The Railway Children and Five Children and It. But much like Roald Dahl, who churned out some seriously creepy adult tales alongside his whacky children’s books, Nesbit had a dark side. The woman who spun fantastic tales of fairies, phoenixes, and magic rings could also write spine-tingling stories of shadows, ghosts, and the sinister side of human nature. These stories are filled with quiet dread and a heavy sense of inevitability— quite often, as with her story Man-Size in Marble, you can see the ending coming but are compelled to keep reading, caught in the trap of knowing what is going to happen and being powerless to stop it. Others, such as John Charrington’s Wedding contain a touch of romance that begins as charming and subtly twists to become horrifying. Nesbit’s reputation as a children’s author is well-deserved, but her contribution to the field of ghost tales and spooky stories is every bit as good, and should not be overlooked. These are only a handful of some of the woefully underrated horror authors out there. Who else do you think deserves to be on this list?